In recent years the luxury superyacht market (vessels over 24 metres in length) has been undergoing considerable evolution. In particular, a 28% increase in world production is forecast for the 2004-2005 sailing year, with an average annual growth rate of 16.4% over the last 6 years. These figures make the superyacht market a business niche with a growing level of attractiveness. Such evolution could not but result in fierce and growing international competition, marked also by the entry of new players . This change of scenario makes it necessary to carry out a competitive benchmarking analysis of the various nautical industries of each country in order to identify not only the competitive ability of each but also the related strategic- competitive positioning. The aim is to take a snapshot of the market with view to outlining a competitive picture, as complete as possible, of the luxury superyacht industry as a whole. The factors emerging from this competitive benchmarking analysis are the concentration of the pool of businesses, the degree of specialisation in the industry for each country, the average length of superyachts produced by each industry/country, the competitive ability level in terms of market performance and the strategic-competitive positioning given by the intersecting of two variables. 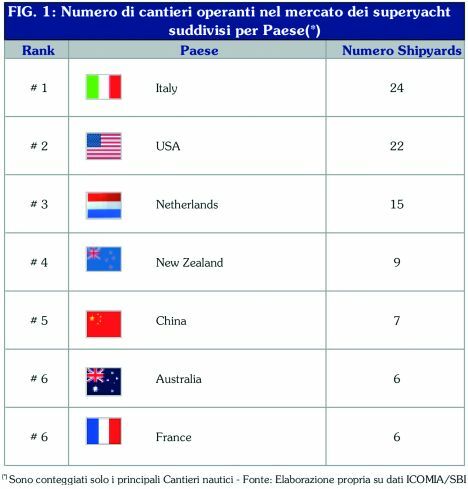 The first point is analysis of the number of shipyards per country that operate in the production and marketing of superyachts. This type of analysis elicits the degree of specialisation possessed by each country within the reference market. It is important to underline that in terms of international ranking Italy is unquestionably the leader with a portfolio of 24 yards scattered throughout the national territory. The USA follows with 22 yards, then the Netherlands with 15 (see figure 1). Over and above geographical concentration, figure 2 shows the competitive level evaluation of the nautical industries of each country in the main business segments . With reference to the latter, the main reference areas are those of the large flybridge and the large open which represent an overall 87% of the entire superyacht market. This datum is especially important for an overall evaluation of competitive strength because, for example, the concept of market leader takes on a different breadth depending on whether it refers to a highly attractive or less attractive business area. In this context, and in terms of overall competitiveness, Italy confirms its leading position in the main business segments and also in the various micro segments . It is important to underline that the only business micro segment in which Italy plays a slightly lesser role than the reference market leader is that of the Large Flybridge over 150 feet. This segment is headed by the Dutch yards with an overall market share of 23% (expressed in quantity), immediately followed by the American yards which show high competitive ability, especially in the over 100 feet range. With reference to the same segment, Italy and the USA tend to have equivalent competitiveness in the over 150 feet range. In the luxury large open business segment, the country with on average a very high degree of competitiveness - apart from Italy which is unquestionably the market leader - is the United Kingdom whose competitive strength emerges in the 80 to 120 feet market. 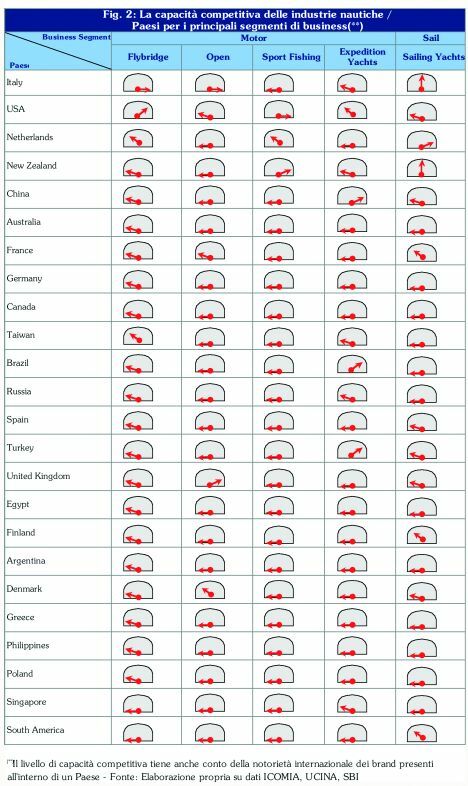 In the same segment Denmark has a medium level of competitiveness in the 80 to 100 feet range while the USA and Italy predominate in the over 120 feet. The situation changes in the sport fishing category where in terms of competitiveness the USA is market leader. On this subject it should be underlined that in the first market range - vessels between 80 and 90 feet - the USA has almost exclusive competitive ability whereas, on the whole, New Zealand offers a decidedly high level of competitiveness. As for luxury sailing superyachts, various countries jostle for leadership. In general the Dutch yards demonstrate high competitive ability - especially in the over 120 feet micro segment - while France is highly competitive in the 100 to 120 feet category. In this case too Italy attracts attention with an average competitive strength, its best competitive performance being in the micro segment of sailing superyachts over 150 feet. The scenario changes radically in the Expedition Yacht segment which is headed by China and followed only by Brazil and Turkey. But competitive benchmarking cannot and should not end here, because it is equally fundamental to consider positioning in terms of average length. At an overall level figure 3 shows how Germany and the Netherlands are the only countries with an average length greater than the world average (204 feet for Germany and 158 feet for the Netherlands). Italy is positioned in lower terms with regard to the world average with an average length of 111 feet, also lower than the USA with its average length of 116. The Italian nautical industry can claim a length above the world average only in the Open category: 96 feet as against a world average of about 95. In the Large Flybridge segment the industries/countries with lengths above world average are the Netherlands (168 feet), New Zealand (156), France (165), Germany (196) and Denmark (160). Proceeding, we may analyse competitive positioning in greater depth by considering two variables of crucial importance: market share percentage and average length in feet. From the intersection of these data it emerges that Italy and the USA are the countries with the absolutely highest market shares expressed both in units and in length. 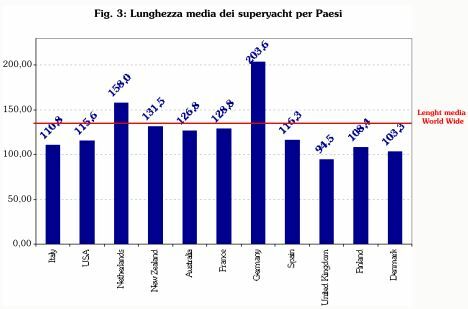 But also in this case the market leader is the Italian nautical industry: 38.2 % market share in quantity and 36.3% market share in length. A further point of analysis regards competitive positioning. The aim here is to delineate the competitive position of a given industry/country within the more general overall framework represented by the whole market. In the specific case, figure 4 shows competitive positioning with regard to the large flybridge category. In this context Italy stands considerably apart from the other countries, since Italian nautical industries feature a very positive market share/average length of production ratio. Within the same market the competitive position of the Netherlands should be noted: the market share is similar to that of the United Kingdom, the only difference being a decidedly larger average length production. The position of the USA is, on the other hand, halfway between that of Italy and the other main countries. With regard to the latter, Germany has the lowest market share but is distinguished by outstanding positioning in the custom large flybridge category. 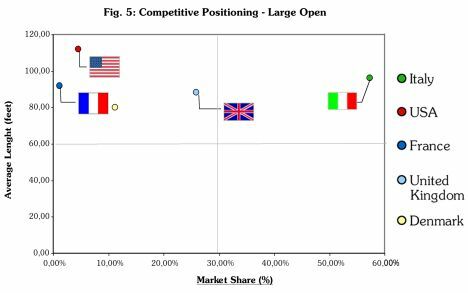 Lastly, figure 5 shows competitive positioning with regard to large opens. In this case too Italian industry leads the field but without obfuscating the interesting competitive positioning of the United Kingdom which is given by a decidedly balanced market share/average length ratio. So, to sum up this first competitive benchmarking analysis, Italy is undisputed leader in the main business segments of the luxury superyacht market but should not rest on its laurels because the areas of improvement are clear and many, and other countries are certainly not going to hang around and watch. It isn't easy to acquire and maintain the role of global market leader, but we are convinced that Italian nautical industries, through marketing management, can and indeed must win this exciting challenge. 1. The new entries are not only actual start-up concerns but also derive from the repositioning, in terms of corporate strategy, of certain shipyards that have decided to extend their business portfolio. 2. The main business segments of the superyacht market are: Large Flybridge, Large Open, Sport Fishing, Expedition Yachts and Sailing Yachts. 3. One of the main criteria by which the market may be further segmented (micro-segmentation) is the length criterion (80-89, 90- 99, 100-119, 120-149 and over 150 feet).